OML 122 is located 25 to 60 kilometres offshore from the Western Niger Delta in water depths of 40 to 300 metres. In April 2005, Equator signed a Finance and Service Agreement with Peak Petroleum Industries Nigeria Limited (‘Peak’), the lease holder and operator of OML 122. In return for providing funds and supplying technical services for an appraisal well on each of two discoveries and for a selected exploration well, Equator became entitled to a share of any oil and gas production. The Company’s objective was to work jointly with Peak to prove significant volumes of gas to supply the gas utilisation projects being developed or planned in close proximity to the lease. In addition, it had a near term objective of developing and producing the small oil reservoir discovered in the Bilabri field in the 1970s. In September 2005, Equator and Peak signed a contract to lease the services of the ‘Bulford Dolphin’ semi-submersible drilling rig and, in November 2005, commenced drilling their first well, Bilabri DX-1, on the multi-layered discovery. The extent of the known hydrocarbon reservoirs was found to exceed expectations and, furthermore, the well discovered additional gas reservoirs. On test, the 21 metre oil column in the C2 sand flowed crude oil, with a specific gravity of 39 degrees API, at a rate of 7,188 barrels per day and the gas reservoir in the overlying C1 sand flowed at a rate of 26 million standard cubic feet per day. The flow testing, combined with the well logs, confirmed that the reservoir properties and crude oil quality of Bilabri were excellent. Accordingly, Equator and Peak initiated a development programme consisting of 6 wells and signed a charter contract for a Floating Production, Storage & Offloading vessel (‘FPSO’) with BW Offshore on 17 October 2006. 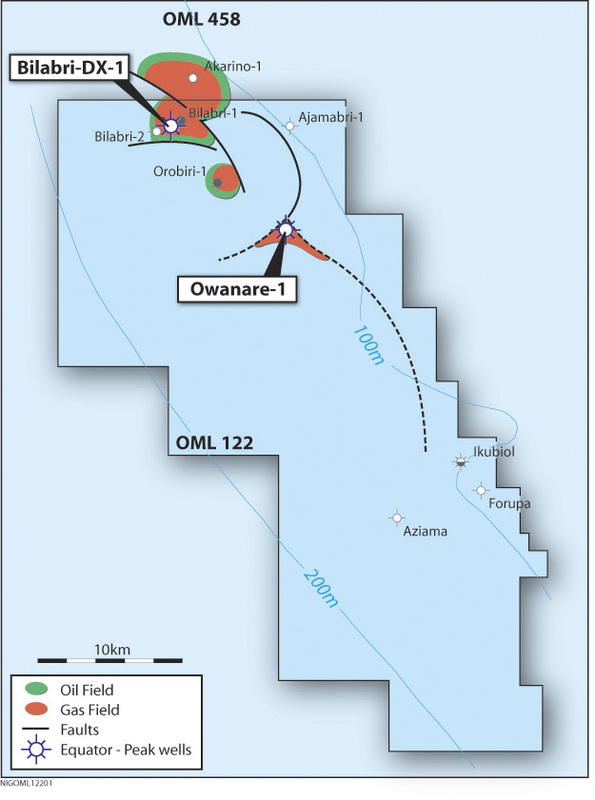 Following the DX-1 well, the Owanare prospect was selected for the exploration well and the AX 1 well was drilled. Gas was discovered in three separate horizons and the well suspended for a future development. The Bilabri field was then further appraised with wells D2, D3 and D4. During the drilling programme, operations were disrupted on three occasions when the field was invaded by militants from the Niger Delta. On two occasions, crew members were taken as hostages. In addition, Peak defaulted on the cash calls for its share of project expenditure. The three additional appraisal wells established that the aerial extent of the C2 sand was larger than expected but determined that the C1 sand contained gas only, NSAI, assessed the Gross Proved plus Probable reserves as 13.2 million barrels. In terms of gas, NSAI best estimate of Gross Proved plus Probable contingent resources of 395 billion standard cubic feet for the Bilabri Field and 106 billion standard cubic feet for the Owanare discovery, giving a total gross contingent gas resource of 501 billion standard cubic feet discovered by wells funded by Equator in OML 122. Based on the results from the appraisal drilling, the scope of the Bilabri oil development was reduced from six to three wells comprising two horizontal completions of the existing D2 and D4 wells plus a vertical completion of the existing DX-1 well. The FPSO entered a shipyard in Singapore on 22 January 2007 for upgrade and delivery in Nigeria in fourth quarter 2007. All of the sub-sea equipment was ordered, scheduled for installation during fourth quarter 2007. Up until 30 June 2007, Equator funded 100% of the cost of developing Bilabri, with expenditure on OML 122 totalling US$263 million. However, during 2007 the project was beset with considerable operational and security problems, including yet another kidnapping, which caused the shutdown of drilling operations. The contract for the Bulford Dolphin drilling rig was terminated for prolonged force majeure on 11 May 2007. Subsequently, BW Offshore terminated the contract for the FPSO. In September 2007, Equator agreed terms with Peak by entering into the Bilabri Settlement Agreement for Peak to take responsibility for operations and funding of the remaining development of the Bilabri oil development. Under the terms of the agreement, Peak assumed the existing and future project liabilities and the obligation to make an upfront payment to Equator. In return, Equator’s interest in Bilabri and Owanare was reduced to a carried interest of 5% in the oil project and a paying interest of 12.5% in any gas development. Peak has yet to meet its obligations to Equator under the Bilabri Settlement Agreement. In order to protect its interests Equator issued a notice of arbitration. Peak was granted an injunction by the Nigerian courts against Equator’s right to arbitrate in the UK citing the fact that Peak admitted its debt as a reason for not allowing the arbitration. A final award, which we believe is enforceable in Nigeria under Nigerian Law, was issued on 27 May 2008 by the Arbitrator in favour of Equator in the total sum of US$123 million plus interest. However, Peak has continued to dispute this in the Nigerian courts. Heads of Agreement, on 9 June 2008, with Mitsubishi as the LNG offtaker. The gas scheme makes exciting use of a new application of existing technologies by FlexLNG. 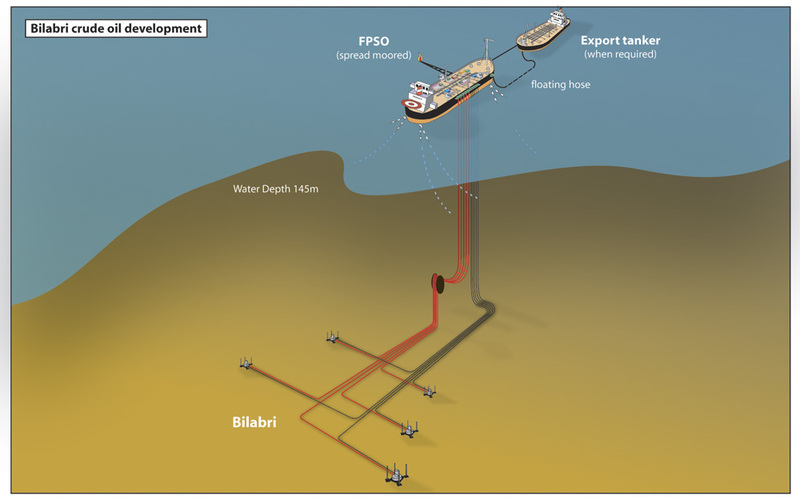 FlexLNG will build and lease a floating LNG processing and storage vessel to be located in the Bilabri field. This will enable gas from Bilabri and Owanare to be produced, liquefied and exported directly to the prime market in Japan where a much higher price can be achieved than that offered by the owners of onshore LNG plants in Nigeria. The cost of a pipeline to an onshore LNG plant is also saved. Both the Oil and Gas developments await funding and the resolution of various disputes. Equator holds a 30% participating interest in each of the highly prospective deep water blocks, OPL 323 and OPL 321. Equator and its bidding group won the blocks in the Nigerian 2005 licensing round with bids comprising signature bonuses (US$161.7 million net), work programmes and level of local content. However, the Korean National Oil Corporation (‘KNOC’) exercised a right of first refusal and was awarded a 60% interest in the blocks and was appointed operator. Equator’s main bidding partner, ONGC Videsh elected not to participate in the blocks allowing Equator to take a 30% interest. The remaining 10% was awarded to Local Content Vehicles (‘LCVs’), Tulip Energy Resources Nigeria Limited for OPL 321 and NJ Exploration Limited for OPL 323. Equator and KNOC carry the costs of the two LCV’s in proportion to their participating interests. The two Production Sharing Contracts (‘PSC’s’) were signed with the Nigeria National Petroleum Corporation (‘NNPC’) on 10 March 2006. Equator signed the Joint Operating Agreements with the other participants on 7 June 2007. In August 2007, the Company executed a farm-out agreement for a 20% interest in OPL 323 with BG Exploration and Production Nigeria Limited. The farm-out is subject to the approval of NNPC and the Federal Government of Nigeria. The Company worked diligently with NNPC and the government to secure the approval but it was delayed by what became a legal dispute between the government and KNOC. Following a number of public and private government inquiries, in January 2009 the award of OPL 323 and OPL 321 to KNOC was voided by the government. The Blocks were simultaneously offered to the winning group of the bid round, which includes ONGC Videsh and Equator. In August 2009, judgement was given in favour of KNOC in a lawsuit that they had brought against the government parties in the Federal High Court in Abuja. Although the government has appealed the judgment, we believe that the government and KNOC are in talks to resolve the situation. In October 2009, the government refunded the signature bonuses of US$ 161.7 million. The Company had requested the return of the signature bonuses in the previous March because, due to the ongoing litigation, it was being denied its right to explore the blocks and faced severe economic hardship. The Company has notified the government of its intention to maintain its interests in the two blocks until such time that the court disposes of the matter and beyond. This notification was acknowledged by the government. KNOC established its technical team in its office in Lagos. Starting with Equator’s work, KNOC developed the interpretation of the 3D seismic survey and identified several prospect horizons in a number of geological structures in each block that are worth drilling. The prospect horizons were ranked and optimum drilling locations were selected for each geological structure. The final step was to rank the geological structures and select the locations of the two commitment wells on each block. Equator took a full part in the direction of all this work by participating in the joint venture’s regular Technical and Operating Committee meetings. The Deepwater Pathfinder was contracted to drill the four obligation wells under the two PSC’s. Drilling would have commenced in 3Q 2009. However, to avoid a large early termination penalty in light of the ongoing litigation, the rig contract had to be assigned to Addax for use in the Joint Development Zone between Nigeria and São Tomé e Príncipe. The assignment of the drilling contract has resulted in a significant deferral of the drilling programme. OPL 323 is located 80 kilometres offshore and lies in water depths of between 890 metres and 2,080 metres. A number of large structures have been identified by interpretation of the 3D seismic survey. Within each of the geological structures there are several prospective horizons. Many of the prospect horizons are supported by seismic amplitude anomalies. Furthermore, the proximity of the block to large oil fields on adjacent acreage supports the presence of source rocks and abundant reservoir sands. OPL 323 is to the west of the Abo Field in OML 125 and immediately to the north of the Bosi and Erha Fields in OML 133. Erha has proved reserves reported by ExxonMobil to be in excess of 500 million barrels and 5 trillion cubic feet of gas and, with its satellite development Erha North, produces in excess of 200,000 barrels of oil per day. Bosi, the second field development on OML 133, produces 135,000 barrels of oil per day. Netherland, Sewell & Associates, Inc. (‘NSAI’), Independent Petroleum Engineers, made a Best Estimate of Gross Unrisked Prospective Resources on OPL 323 within four large structures of nearly 2 billion barrels of oil and nearly 9 trillion standard cubic feet of gas. The subsequent evaluation by the operator differs in detail with regard to the definition, size and ranking of the prospects from the NSAI evaluation. For example, the operator identifies five structures. However, the total of its estimates of the unrisked prospective resources of oil at 1.3 billion barrels, at the P50 level, is of a similar magnitude to the NSAI total. During 2006, Agip made a discovery of both oil and gas in the Okodo-1 well on OML 125. This discovery had a direct impact on the prospectivity of one structure on OPL 323, located only 7 kilometres away. It appears to lie in the same channel as the Okodo discovery, which proved that the hanging wall of the common major bounding fault forms a trap for hydrocarbons and that the immediate area has sources of oil and gas and migration paths. OPL 321 is located immediately to the west of OPL 323, lying in deeper water in the range 1,900 to 2,600 metres. The block lies on trend with block OPL 322 to the south, where Shell’s discovery well Bobo-1 encountered a significant column of hydrocarbons. It has access to the same hydrocarbon sources as the giant Bosi and Erha Fields located nearby to the southeast. NSAI assessed a large prospect to contain Gross Unrisked Prospective Resources of 1.0 billion barrels of oil and 1.3 trillion standard cubic feet of gas at the Best Estimate level. The subsequent evaluation by the operator differs in detail with regard to the definition, size and ranking of the prospects from the NSAI evaluation. For example, the operator identifies four structures. However, the total of its estimates of the gross unrisked prospective resources of oil at 1.6 billion barrels, at the P50 level, is of a similar magnitude to the NSAI total.